Opel once again delighted the spectators on the Silvretta Classic with its vintage cars. The Rüsselsheim-based carmaker honored the 20th anniversary of the rally through Montafon by entering three cars from the Opel Commodore A, B and C generations, thus also celebrating the 50th anniversary of the Opel Commodore, which made its debut in 1967 with a 115 hp 2.5- liter straight-six engine. A GS version with twin carburetors and 130 hp followed one year later. Brand ambassador and Le Mans 24 Hours winner, Joachim Winkelhock led the way for the Opel Classic team in a 1972 Commodore B GS/E (Grand Sport/Einspritzung) with 190 hp. 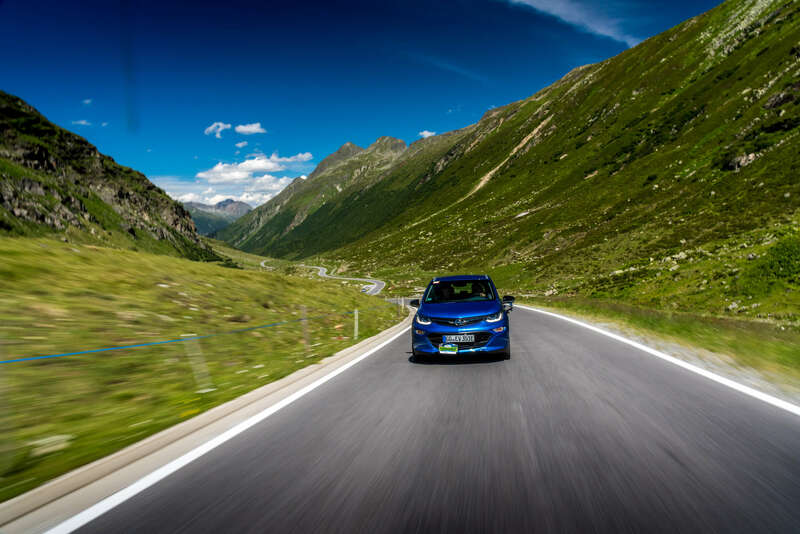 Elsewhere, the revolutionary Opel Ampera-e electric car also proved its everyday suitability by successfully mastering the Silvretta E-Auto Rallye. All three legs of the Silvretta Classic started in Partenen and the teams had to cover more than 600 kilometers on winding roads through the Austrian Alps. The highlights for spectators and participants alike, apart from the vintage cars, included the Silvretta Hochalpenstrasse with the 2,037-meter high Bieler Höhe; the ascent to Piller Höhe on day two and the “Grosser Preis von Vandans” as the spectacular finale on Saturday. In addition to showcasing its long tradition, Opel also created a link to its current model line-up by displaying the new Opel Insignia Grand Sport. Elegantly sporty like a coupé, generously spacious thanks to an all-new architecture and with the safety befitting a flagship, the second generation Insignia not only offers dynamic looks and wellness; the wide range of intelligent technologies is also unrivalled in this market segment. The portfolio includes pioneering Opel IntelliLux LED® matrix lights and all-wheel drive with advanced torque vectoring, state-of-the-art driver assistance systems and a head-up display. Euro NCAP has just confirmed the integrity of the new Opel Insignia’s total concept. In its latest safety ratings, Euro NCAP awarded the Insignia Grand Sport and Insignia Sports Tourer the maximum five stars. High-end connectivity with Opel OnStar and smartphone projection adds the icing to the cake. In summary, the new Insignia offers such high agility, such a spacious interior and such excellent value for money that it even rivals cars from premium brands. Prior to the start of the vintage car rally, the vehicles of the future displayed their credentials in the Silvretta E-Auto Rallye. Opel participated with a new Opel Ampera-e, which mastered the more than 260 kilometers with many time and skill tests over two days with ease. From Schruns over the Silvretta Hochalpenstraße, Bludenz and Lech, the route crossed various Alpine passes in Vorarlberg and Tirol. From around 600 meters above sea level, it repeatedly reached altitudes of over 2,000 meters. With 520 kilometers according to the New European Driving Cycle (NEDC), the Opel electric car offers an unchallenged higher range than the closest competitor in the segment. Also approximated to the speed profile (shorter test procedure) defined by the WLTP (Worldwide Harmonized Light-Duty Vehicles Test Procedure) driving cycle, the Ampera-e is convincing. Based on this development test, engineers estimate combined WLTP range at 380 kilometers – dependent on personal driving style and external factors. And if higher speed and power is called for during mountainous ascents and descents, the Ampera-e’s 150 kW/204 hp electric motor ensures impressive acceleration and elasticity with its maximum instant torque of 360 Nm. This takes the electrically-powered five-seater from zero to 50 km/h in a sportscar-like 3.2 seconds; mid-range acceleration during overtaking from 80 to 120 km/h is covered in just 4.5 seconds.